Fixed the problem with Texel Alignment in the DX6, DX7 and DX8 renderers, so everything looks sharp, like when Glide3x is used. DX8 supports fog effect. Thanks to Verok for investigation. The DX7 graphical glitches like the black polygon near the Old Church were workarounded. DX7 doesn't output 640×480×16 if this mode isn't supported. Also it returns sorted list of resolutions now. A small optimization of texture loading. The thrash_about isn't called when it is not really needed. More strict checking of validity of a thrash driver (a renderer). New error messages for some problematic situations: too long path to the root directory (it has not to be longer than 210 characters); thrash driver not found. DirectDrawLagFix was renamed to DisableMaxWindowedMode in the thrash.ini files. It is disabled by default now. A new DirectDraw compatibility flag NoDwmOffForPrimaryLock was added to the thrash.ini files. The game asks a renderer if it supports the fog effect. DX5 and SoftTri always report that they do not support the fog effect. Refactoring of the video mode init code. Video mode restore function will not be called twice at exit. More useful changes are planned for next versions. Thank you for your donations! Keiiko, NFS1: SE has two exe files. One is for DOS and other one is for Win95 and uses Direct Draw and Direct Sound. Thank you for your advices but I already know how to run both versions. The problem is that they don't work ideal. This game needs proper patch from VEG. VEG your patch is amazing! It basiclyl give AI cops better cars and make the Hot pursuit more challenging. Beterhans what are all these files there for, and demos? Milan - could you tell me how to run the Windows version of TNFS:SE? Now before you run the game with NFS_WIN.EXE close all programs cause for me game won't run when Mozilla or Fraps are running. Hope this helps you. Milan, thank you very much for the NFS-2-SE cross platform patch! The only problem is that I can't change resolution. In normal Glide mode you just had to set a custom resolution in the nGlide configurator (up to 7680 x 4320 pixels), but now everything is scaled to 4:3 standard resolution and can't be changed. I hope this will get fixed in the future and maybe it's also possible to get the cockpit view in 3Dfx Glide mode. Tuurngait, almost a year ago I talked to the guy who made NFS2 patch. I asked him about widescreen support, cockpit view and other cool stuff that he could implement. He told me then that he doesn't know how to do that. His main goal was to make Glide version of the game cross platform and to fix multiplayer. It seems to me that he doesn't have the skills like the VEG has. VEG, why you changed default thrash driver from "nglide" to "dx7" in your current beta 1.6.2? Tuurngait, just because I'm improving and testing it now. I installed the patch but I don't get the option of widescreen resolutions in the menu. Can someone show me how to do it? Thanks in advance. 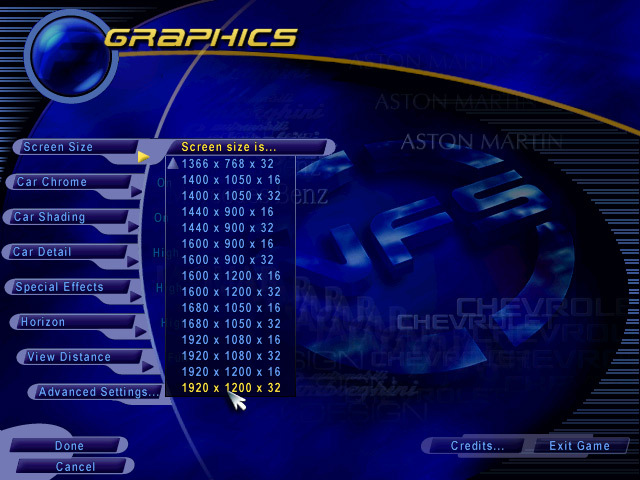 ace, All widescreen resolutions are available in the resolutions list in the graphics settings. Maybe if the strings indicate the aspect ratio it could avoid confusion to many people. Hey, this looks awesome, but installation instructions are unclear. So you want us to make copies of the original FEDATA and GAMEDATA folders from the CD, then extract all the files from your download to the CD? I'm confused. Where do all the other files like "drivers" and "eacsnd.dll" go? India, instructions are for the installing from the original CD. If you have downloaded the Modern Bundle, it already includes Modern Patch (v1.5.3). You can update it to the v1.6.1, but it is optional. Works fine on LinuxMint 17.2 Xfce - and Wine 1.6.2! Found this today and was pretty excited to try it out. It just works without issue on Windows 10 64-bit with my GeForce GTX 960M. This makes me pretty happy to play this game after years of not getting it to work properly on later OSes. Check out my AI COP difficulty upgrade Patch Demo. Now the Pursuit is more exciting! Is that possible to make a key to switch camera view on to AI police car? current you can only switch to other racer and human player by click the name or the dot on map. I'm enjoying the hell out of this patch with mods and stuff. I can hardly wait for VEG's great talent with the Modern Patch for NFS4! I Think you should modify you readme file for the Installation part a bit, I had a hard time for it! "1. Copy FEDATA and GAMEDATA directories from the NFS3 CD to a new empty directory." I have a hard time to understand it! and failed to install the game. Where is this empty directory? why copy to a empty directory but not the NFS3 directory? what's the point of the empty directory? will you patch smart enough to find this empty directory have NFS3 file without tell it?? After 1 hour, I realized the Empty directory is the NFS3 directory but you need me to uninstall first. 1. Uninstall your current version of NFS3! 4. Copy FEDATA and GAMEDATA directories from the NFS3 CD to the fold you made at step 3! 5. copy Extract contents of this archive into that directory made in step3 with replacement of files. The Replay file will not play correctly a crosse different versions,. beterhans, this instruction is about installation, not about reinstallation. So, there is no steps about removing any previous versions of the game because generally it is not required. All versions have to be compatible. Are you sure that everything else are the same and only patch versions are differ? Maybe list of cars are also different? Different lists of cars may cause incompatibility of replay files. It's a known bug of the original version of the game, and it is still not fixed. Yes I know but you'd better point out create an empty folder FOR the New NFS3. Because when I 1st saw your instructions, I thought it's just a temporary folder for the installation process. and since you call it a patch, SO I install the game from CD 1st, them apply the patch. but It won't work this way. replay will play for 1-2 laps without problem them out-of sync. player hit wall and still press gas. This means if different version of modern patch play together can also cause out-of sync problem. BeterHans, it has to be compatible. Maybe game files on your NFS3 cd are not original, I don't know. Please try to update the Modern Bundle v1.5.3 to v1.6.1 and check if the problem still occurs on your PC. Also please provide your replay file where the problem occurs. - In the Playstation version you can choose between "beginner" and "expert" cops and the Diablo SV cop is present on almost every track. The cops are also a lot harder and they don't patrol but instead stand near the side of the road waiting for you and then pursue you. - In the Playstation version you can switch cars during the tournament mode, so you can drive different cars. - In the Playstation version the cops shout at you (in the PC version you have to use the "bullhorn" cheat). I don't think it's necessary to dig the replay or network play problem between versions. just tell everybody to use the same version for network and replay is fine. Thanks ALOT for this GREAT WORK. Don't forget after overwriting existing (old) files to disable this. i really enjoy this game and this new graphics are awesome. Any way to get NFS Manager (also called NFS3 Manager) to work on these files? On XP (and original installs), this program allowed you to swap car and tracks in and out. I have several of each saved on my XP machine; would be awesome to transfer them to my 7 install and your version of the game. Thanks! For the record, NFS3 Manager can be found in the download location below. After some fuss, I got it running on Fedora Linux 25 with Wine 2.0. I'm 18 now and have been playing this game for most of my life across two different machines running Windows XP, Windows 7, VirtualBox Windows XP hosted on Fedora 25, and finally now Wine on Fedora 25. This is truly a monumental undertaking that you accomplished! Now you are distributing it for free to fellow diehard NFS3 players. Our world needs more people like you! Thank you very much! I wonder... There is HUGE advantage using vertex headlights instead of projected, because vertex usually covers more vision in-front of the car instead of projected. Also projected has problem with contrast when lighting the road (near impossible to track the road; escpecially visible in lost canyons in reverse at night). I wonder if it is fixable. Also - really good job for giving this game second life. Does this patch have the cars that were available for download or included with the Walmart or Australian releases? David J., it is included in the Modern Bundle. Modern Patch itself doesn't include any cars or other additional content. There's a new update in the work? And do you continue NFS 4? Momo Shiina, beta version was updated recently. It still has some regressions, so I'm not releasing a final version. VEG, what's new in 1.6.2 beta and what regressions do you mean? NFS 4 will be continued? Ah, I red the changelog. Many great improvements. I assume you meant NFS 4 won't get a final version? That's really sad. Momo Shiina, I'm planning to make some great changes for the NFS4 also. But it takes much time. So it will not be very soon. Currently I'm planning to finish some internal work (refactoring of some code according to rendering initialization) in the NFS3, and then I'm planning to port the best features of the NFS3 Modern Patch to the NFS4.